Alexander’s Inn located in Sante Fe, New Mexico, is where our attention to detail and accommodating service will ensure that you’re trip is a memorable one. Stay in one of our relaxing casitas and wake the next morning to enjoy the sunlight from our patios. 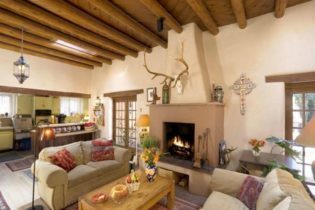 Relax in our traditional Santa Fe casitas, featuring kitchens, kiva fireplaces, New Mexican furnishings and decor. Guests rave about our heavenly beds, made up with fine linens, down comforters and feather pillows. Also available is a guest membership at the full-service El Gancho Health Club. Although we no longer serve breakfast at the Inn, each arriving guest is welcomed with a basket filled with homemade cookies, fresh fruit, coffee & teas, wine, chips & salsa. You can also take advantage of our luxurious spa the Absolute Nirvana. It is locally owned and operated and offers a wide range of treatments including: facial treatments, therapeutic, hot stone and Thai massage. 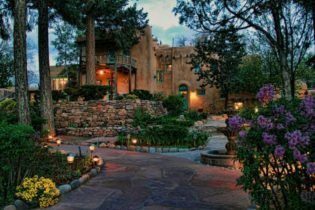 For guests preferring a true Santa Fe Bed & Breakfast experience, please visit our sister inns, The Hacienda Nicholas and The Madeleine Inn. Best B&B location in Albuquerque at our historic garden oasis in the heart of Old Town. Leave your car parked and walk to restaurants, shops, galleries and museums. The Bottger Mansion is in the heart of historic Old Town Albuquerque, so close that you can see the Plaza from our front gate. We are Within walking distance of restaurants, shopping, galleries, museums and parks. Our home is less than a mile from the Albuquerque Botanic Garden, Zoo, downtown Convention Center, theaters, and nightlife on Central Avenue–Old Route 66. 10 minutes to the airport. Enjoy comfortable rooms, modern amenities and original architectural details in our 1910 home. A room includes delicious full breakfast, free parking and WiFi, private baths, phones, cable TV, individual heat and A/C, complimentary snacks and beverages, shady yard full of trees, birds and fountains. 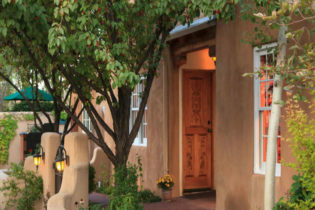 El Farolito Bed & Breakfast Inn is located in the charming, downtown historic area of Santa Fe, NM. We are near the capital – secluded yet easy-to-find and within walking distance of numerous galleries, shops, restaurants and historical sites. 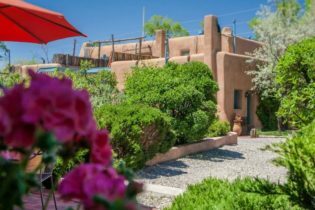 One of Santa Fe’s finest bed and breakfast inns – El Farolito has seven romantic casitas tastefully decorated in true Santa Fe style. The bed and breakfast is located in the historic district and a short five minute walk to downtown shops, galleries and restaurants. Santa Fe offers everything from world-class skiing and spectacular hiking to fantastic fishing and sailplane soaring among the clouds. Adding to your enjoyment is a mild climate and sunny skies atop a mountain backdrop of lushly forested public lands. Santa Fe offers something for everyone! See adobe architecture, enjoy art on every corner with an abundance of museums, galleries and festivals, see music, theatre, dance and opera, ride the train at the Santa Fe Southern RR, see the rodeo, or enjoy an afternoon of eclectic shopping. Whatever your pleasure, you’re sure to find it in Santa Fe and we look forward to hosting you at El Farolito Bed and Breakfast Inn. We were awarded “Best Small Property of the Year” by the New Mexico Hotel & Motel Association. 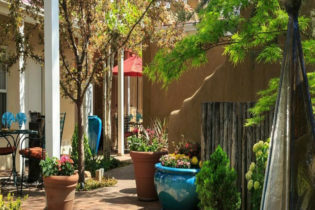 Four Kachinas Inn is located in the charming, downtown historic area of Santa Fe, New Mexico. We are near the capitol - secluded, yet easy to find, and within walking distance of numerous galleries, shops, restaurants, and historical sites. To fulfill our mission of providing our guests with an experience of relaxation and rejuvenation while allowing whatever level of interaction with the outside world you desire, we have created six unique guest rooms with private baths, king and queen beds, and full breakfasts. Welcome to the Four Kachinas Inn, where modern luxury meets Southwestern charm in the heart of Santa Fe, New Mexico, just moments from the heart of scenic downtown. The Four Kachinas provides a comfortable base from which to explore the city’s unique blend of heritage, natural beauty, and cosmopolitan ambiance. A short walk to the historic Plaza offers some of the finest shopping, galleries, and dining available in the Southwest. Our cozy hideaway features six spacious rooms, each uniquely adorned with Southwestern art and plenty of New Mexico charm. All accommodations include a private bath and cable television, and most have their own garden patio. A sumptuous breakfast is served daily and our attentive staff is always on hand to help maximize your comfort and enjoyment. A traditional adobe hacienda built around a garden courtyard near the Plaza, Hacienda Nicholas in Santa Fe, New Mexico provides absolute comfort & serenity in a warm, relaxing setting. Whether you're here for a romantic weekend or a winter getaway, our attention to detail and superior personal service will ensure a memorable Santa Fe vacation. Make your Santa Fe vacation a truly memorable experience with a stay at Hacienda Nicholas in New Mexico. Enjoy a great night’s sleep in our beds of feather and down. Unwind in the peace and tranquility afforded by extra-thick adobe walls, or go one step further and indulge in a rejuvenating massage, spa treatment, or facial at our acclaimed Absolute Nirvana Spa. Savor the luscious aromas from our heavenly rose garden and partake of delectable buffets at breakfast and tea-time. We use only natural, fresh, and organic ingredients, and often serve regional specialties. Enjoy guest privileges at the full-service El Gancho Health Club or relax around the outdoor kiva fireplace that takes the chill out of the air on cooler days. Come unwind in the sanctuary of Hacienda Nicholas. Leave your cares behind and allow our dedicated staff to help you make the most of Santa Fe. It’s time you have the respite you deserve. 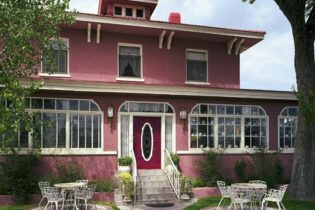 This elegant 1886 Queen Anne Victorian, known as The Madeline Bed & Breakfast in Santa Fe New Mexico, offers full breakfasts & an evening wine & cheese hour. Our new Indonesian-inspired spa, Absolute Nirvana, was selected by Conde Nast Traveler as "One of the Hottest New Spas in the World". The Madeline Bed & Breakfast, located in a quiet, secluded garden setting in Sante Fe, New Mexico, is the perfect alternative to a Santa Fe hotel. 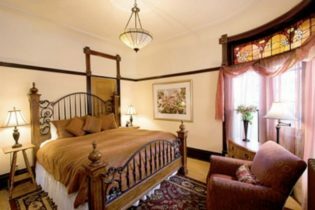 Built in 1886 by a local railroad tycoon, the inn features unique stained glass windows, ornate fireplaces and period antiques. We serve a bountiful breakfast of regional favorites such as Southwestern frittatas and breakfast enchiladas, along with fresh fruit, homemade muffins and granola, yogurts, whole grain breads and fresh-roasted coffee. We use fresh, organic and natural ingredients. In the afternoon nibble from the overflowing platter of homemade cookies as you sip iced or hot teas in the garden or in front of a roaring fire in the parlor. For the ultimate in relaxation, treat yourself to a treatment Absolute Nirvana Spa, our luxurious Balinese-style spa, located in the back garden. Enjoy such authentic Asian treatments as the Javanese Lulur treatment, created for Indonesian royalty many centuries ago. End you treatment with a soak in a hand-carved granite tub, surrounded by the petals of a dozen red roses, as you sip hot Javanese Ginger Tea and nibble from a plate of tropical fruits and a homemade chocolate truffle. Our staff of master level therapists also offers a full selection of Deep Tissue Massage, Swedish, Hot Stone and Thai massage, as well as an array of facials. After a long day of sight-seeing and touring, melt into our deliciously comfortable beds of fine 100% cotton linens, down comforters and feather pillows. Member: The Green Hotels Association. 154 yr old Historic adobe pueblo-style compound nestled quietly in downtown Santa Fe! Experience Traditional Old Santa Fe! Delightful historic adobe pueblo-style downtown Santa Fe Bed and Breakfast. Secluded. Quiet. Enchantingly nestled in Santa Fe’s historic district. A truly one-of-a-kind experience in traditional Old New Mexico lodging. Built in 1860 (originally a circuit judge’s estate with horse stables, servants’ quarters and a Native American bread oven) Pueblo Bonito provides a memorable and affordable alternative to Santa Fe hotels. Architecturally indicative of Northern New Mexico culture, our enchanting adobe compound is in the pueblo-style: built of 2 ft thick adobe brick, encasing 19 enchanting guest room with red brick paths and mature landscaped private grounds. Pueblo Bonito is a convenient and easy stroll to the historic Santa Fe Plaza, New Mexico state capitol, Loretto Chapel, Santa Fe depot, picturesque art galleries on Canyon Road, exciting boutiques off Guadalupe Street, and intriguing Santa Fe restaurants. Year round events and daily activities provide Santa Fe visitors with opportunities to experience Native American culture, historical Santa Fe tours, music festivals, photography exhibits, art shows, Canyon Road gallery walks, Santa Fe cooking classes, poetry making, Opera and other performances all year round. Intimacy is a natural part of our historic Santa Fe bed and breakfast. Each of our unique Santa Fe lodging accommodations offer a selection of historical elements to choose from in 18 private guests rooms! Create your own memorable Santa Fe travel experience. Interior elements consist of: Hand-crafted wooden furniture, southwestern decor, antiques, vigas (wooden beamed ceilings), nichos (hand formed recessed areas in walls), wood burning corner Kiva fireplaces, corbels (decorative carved wood support beams), etc. Each charming casita (room) has it’s own private entrance and bathroom (tub/shower combination), WiFi, flat screen cable TV, refrigerator, microwave and coffee setup. Rooms are uniquely named after area Indian tribes (i.e. Tesuque, Nambe, Taos, Chimayo). We warmly welcome all our Santa Fe visitors- new or returning from over 30+ years! All are welcomed and encouraged to “enjoy the city different” – the way it was meant to be experienced! 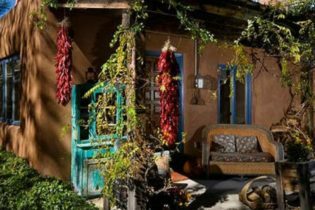 Historically significant, culturally accurate – where else better to experience Real Old Santa Fe than Pueblo Bonito bed and breakfast? Book today and enjoy New Mexico the Pueblo Bonito way!